Deep Brain Stimulation (DBS) depends on precise placement of the stimulating electrode into an appropriate target region. Image-based (direct) targeting has been limited by the ability of current technology to visualize DBS targets. We have recently developed and employed a Fast Gray Matter Acquisition T1 Inversion Recovery (FGATIR) 3T MRI sequence to more reliably visualize these structures. The FGATIR provides significantly better high-resolution thin (1mm) slice visualization of DBS targets than does either standard 3T T1 or T2-weighted imaging. The FGATIR scans allowed for localization of the thalamus, striatum, GPe/GPi, Red Nucleus (RN), and Substantia Nigra (SNr) and displayed sharper delineation of these structures. The FGATIR also revealed features not visible on other scan types: the internal lamina of the GPi, fiber bundles from the internal capsule piercing the striatum, and the boundaries of the STN. 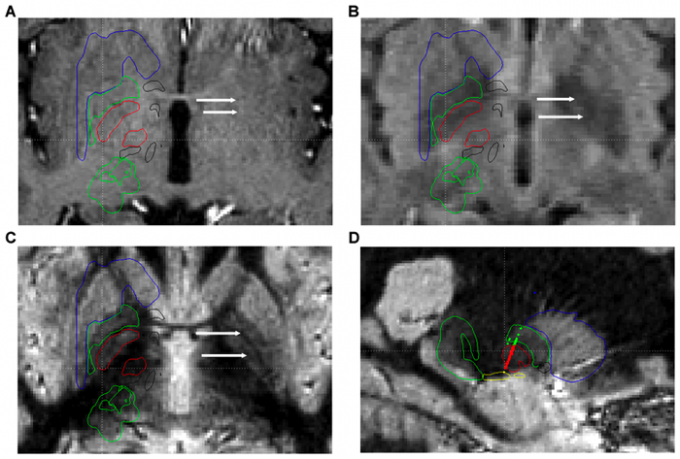 Sagittal images of subcortical structures in the A) T1-w 3D MP-RAGE, B) T2-w 3D FLAIR, C) T1-w FGATIR, and D) T1-w FGATIR with deformable atlas contours overlaid. The contour colors for the deformable atlas are (from most anterior to most posterior): striatum (blue), GPe (green), anterior commissure (black), GPi (red), optic tract (yellow), thalamus (green), various VL thalamic nuclei (green), STN (red), and SNr (black). Subcortical images from a GPi DBS patient (pre-surgery) showing axial slices (with deformable atlas overlay) on the A) T1-w 3D MP-RAGE, B) T2-w 3D FLAIR, C) T1-w FGATIR, and a sagittal slice through the D) T1-w FGATIR with MER maps overlaid (represented by the colored dots). The white arrows represent the location of the lamina between GPi/GPe and the lamina within GPi. In panel D, the dot colors represent cells found in GPi (red), GPe (green), striatum (blue), and optic tract (yellow). We believe that use of the FGATIR to aid initial targeting will translate in future studies to faster and more accurate procedures with consequent improvements in clinical outcomes. This scan has been implemented along with the 3D Brain Atlas developed at UF in a new piece of software used in our operating room to further increase the accuracy of our targeting for Deep Brain Stimulation surgery. All parameters used in this study are based on a Siemens 3T Allegra. If parameters are to be used for a 1.5T scanner, the TI should be significantly changed. 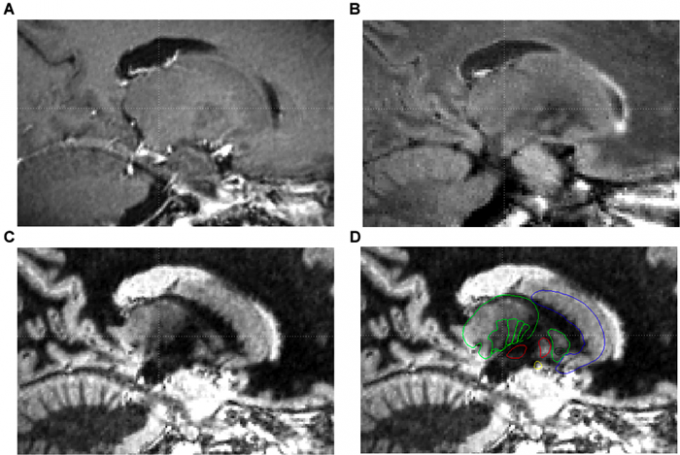 Sudhyadhom A, Haq IU, Foote KD, Okun MS, and Bova FJ, A high resolution and high contrast MRI for differentiation of subcortical structures for DBS targeting: The Fast Gray Matter Acquisition T1 Inversion Recovery (FGATIR), NeuroImage (2009).